There are many herbs for anti-aging or preventive medicine, probably ginseng or lysium fruit is the most known for their effect of anti-aging, but I like to start with he shou wu in anti aging herbal medicine. It helps anemia by generating blood, dysmenorrhea, uterus infection, chronic constipation and so on. And he shou wu is the very powerful in lifting the energy of the elderly. Its effect on the kidney function keeps people from having grey hairs and shedding and if taken for a long term, it also prevents the aging. 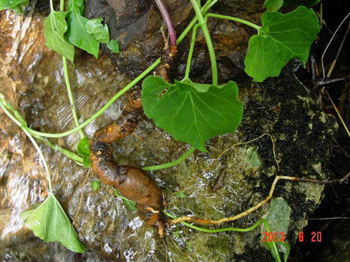 Chinese consider He shou wu together with ginseng, gou qi zi as the three best herbs. With shu di huang, sheng di huang, dang gui, huang qi, for dysmenorrhea, with Korean mistletoe and tu si zi for calme the fetus and stomach pain or hemorrhage during the pregnancy. Decoctions of he shou wu have shown an inhibitory effect in vitro against Mycobacterium tuberculosis and Shigella fexneri. It increases the absorption of glucose and amino acid in the small instestines and stimulate the intestines so as to relieves constipation. And in one clinical study, 88 patients with high level of cholesterol in the blood were given decoctions of he shou wu and in 78 cases the level of cholesterol decreased. Without side effect, he shou wu lowers the blood pressure and inhibit cholesterol from accumutating on the liver.